So, this week’s topic for the League is “pirates”. Unfortunately, I’ve already extolled the virtues of one of my favorite pirate movies of all time, The Pirate Movie, during it’s 30 year anniversary last year. So, I can’t un-pop that cork. My next best option is to talk about Muppet Treasure Island. And more specifically, the soundtrack. Muppet Treasure Island was released in 1996. It was the second of the Muppet movies, after Muppet Christmas Carol, to be made in partnership with Disney and after Jim Henson’s death. It starred Tim Curry as Long John Silver and Kevin Bishop as Jim Hawkins. The movie, financially, was a success earning a higher gross than the last three movies. The movie itself is funny and clever. Curry is great as Silver. Bishop is, well, not awesome. His voice is really high, like a 6 year old girl. It’s really sort of annoying. Other than that I enjoy this movie as much as I enjoy Muppet Christmas Carol. 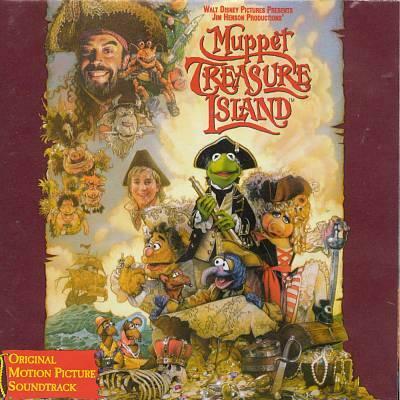 In general, I see Muppet Christmas Carol as a better movie but Muppet Treasure Island has the better soundtrack. Now, let’s take a look at that awesome soundtrack with a bunch of very catchy, totally Muppet-style songs that are all pirate themed. This exists. And I own it. Here are some of my favorite songs from the soundtrack. Shiver My Timbers is the song that plays over the opening credits featuring pirates burying treasure on an island. Treasure Island. It’s very dark and is very chant-like. It’s probably my favorite song, and it’s totally pirate-y. Sailing for Adventure is the song that sort of jump starts the action in the movie. It’s standard but fun, the rats have the best lyrics. Oh, you also get a full load of Bishop’s girly falsetto. But then again, you get a great Curry lyric in which he swings for the fences and sings the hell out of his few lines. Professional Pirate is the one full number that is shouldered by Tim Curry. The song is okay, but the joy is in listening to Tim deliver it, Curry-style. Yes, I still own this soundtrack and yes I still listen to it. I think the movie is a bit underrated and fun. It’s definitely better than Muppets from Space. -Dex blows my mind talking about a “pirate metal” band called Alestorm. Seriously, that’s a thing. And it’s awesome. This entry was posted on January 31, 2013 at 1:59 pm and is filed under movies, music, pop culture with tags LEB, movies, Muppets, music, pirates, pop culture. You can follow any responses to this entry through the RSS 2.0 feed. You can skip to the end and leave a response. Pinging is currently not allowed. My favorite Muppets movie is Muppets Take Manhattan, but this one’s in the Top 5, for sure. I just automatically love anything with Tim Curry in it. I’ve never seen Muppet Treasure Island. As cute as I think Kermit and Piggy are, puppets kinda creep me out so I never really got into that whole thing as a kid . I couldn’t bear to watch Fraggle Rock.